[New for 2017] Disclaimer: blueberry ice cream is not my thing. Ok, I say that about a lot of things, but it's just not something I gravitate towards unless there is an x-factor like pie crust bits. That said, I wanted to try at least one more of the new flavors in Turkey Hill's all natural line up. (Note: this line up is what I eat when I'm not eating/reviewing something new). I scraped the lid after taking this shot and decided to make myself a shake because it seemed to have a fairly mild flavor. I wound up getting the ratios wrong but the milkshake was decent if a bit too weak. Sorry that the color looks different in each picture, the next one is probably most accurate. Fast forward to a real serving, albeit a small one. Well, there's no mistaking that it's a blueberry flavor. 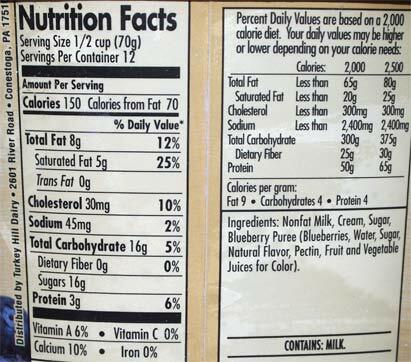 The only problem is that I have no urge to eat plain blueberry ice cream. I want it to have some sugar crumble or pie crust or granola bits or anything. I don't know how to eat blueberry ice cream.... WHOA, just had a huge flashback to eating blueberry smurf yogurt. 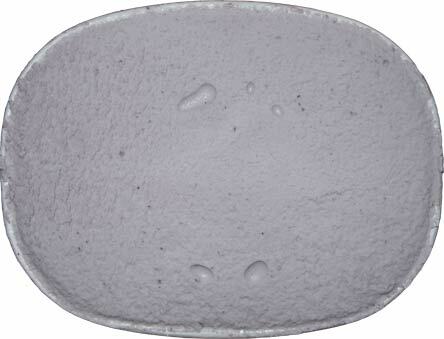 That's what this is though, it's a good blueberry yogurt, just colder (and with better texture). On Second Scoop: Oh my was this good on a donut. It went so very well together. The strawberry sauce and Trix crumbs helped round things out. This was an absolutely delightful breakfast sundae. I may be eating the rest of the container like this. 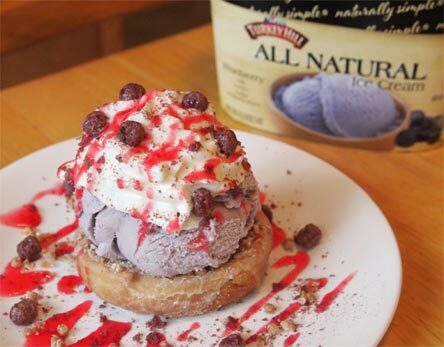 Your breakfast sundae makes me want someone to make a blueberry cake donut flavor. Ben and Jerry's should get on that. Yes! Salted Caramel is my favorite too! All natural ingredients. Love it! 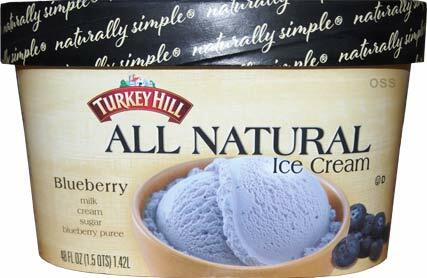 I think it would be even yummier(lol)...if Turkey Hill made a Blueberry swirl. 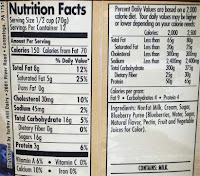 Same Blueberry ice cream but maybe mix it with pure vanilla ice cream. Kind of like their Orange Cream Swirl. Otherwise, I do love this Blueberry flavor! Add Reddi-whip topping for a super creamy blueberry taste! I can appreciate creativity, but I think these ice cream companies need to understand that just as "Classics are classic for a reason" other flavors are non-traditional, not classic for a reason also. I love blueberries, but a big part of my enjoyment of them is from the texture of chewing on them, and the fresh juice bursting in my mouth. You get that experience with pancakes, waffles and muffins made with fresh blueberries. This is just sweet cream ice cream infused with a smidgeon of blueberry juice. So damn good, I love it... one of my new favorite flavors... hats off to the people at turkey hill. very appealing. I have been enjoying this flavor most of the summer. 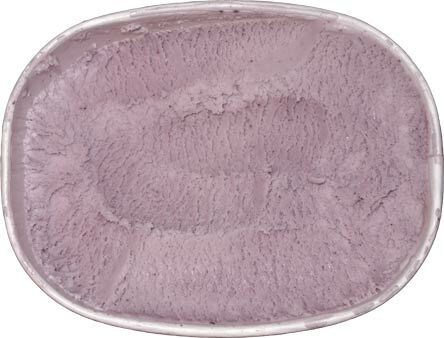 It's perfect on fruit pies and cakes not overpowering - a nicely balanced delicate blueberry ice cream that compliments other flavors. I was at the market today and it was priced low with a notice that said it will be discontinued. Is this true? I really like it.